Here you see the natal chart of the Great Emancipator, President Abraham Lincoln, born Feb 12, 1809, with the planetary placements for the time (about 10 pm LMT on April 14, 1865) that hot tempered John Wilkes Booth shot him in the back of the head at Washington’s Ford Theater. And Booth actually believed he’d be celebrated for it! Update 2.2.09: you may wish to read Byron King’s fascinating assessment of John Wilkes Booth, his beef against Pres. Lincoln, and the night in question. Did you know that Booth’s father, Junius Brutus, was named after one of the assassins of Julius Caesar? Odd how that relates to Booth’s cry in Latin after the shooting. In pink I have highlighted the Mystic Rectangle (a pattern of ‘practical mysticism’) which had formed in the sky as Lincoln was shot, and remained over him as he lay dying. At his moment of death, transiting Moon 9Sag05, conjoined his natal MC, with an angular Moon often present in cases of death (and an angular Jupiter is often involved as well); natal Neptune in 9th house with Saturn 3Sag09 adds to a picture of loss and grief. Moon/Saturn = depression; Moon/Neptune = exposed to peculiar and strange influences, or being exploited by others; instability, weakness, crisis. And having a natal Saturn conj Neptune gives a morbid bent which was aggravated for Lincoln by his birth during the Balsamic (darkened) phase of the Moon. This is the ‘endings and partings’ phase and you probably know that he lost siblings at early ages, as well as suffering the worst loss of them all–loss of children. The spiritualism of the age–contacting the dearly departed bwo seance–was an unfortunate and bogus direction for this depressive energy to go (I’m trying to avoid using the word, “channel”!) As the Scriptures say, ‘the dead are unconscious and know nothing and have no part in anything under the Sun.’ I often wonder: how much clearer could it be? So, the transiting Moon with natal Neptune forms a midpoint and was at Mc, too. Ebertin, in his “The Combination of Stellar Influences,” gives this midpoint pair biologically as ‘a paralyzed blood circulation’ or ‘an over-accumulation of water in body tissues.’ Also, ‘eye problems’–the bullet had lodged behind the president’s right eye. That would have to be considered a problem. The Moon-Neptune pair has possible intimations of other realms within subconscious stirrings, and I doubt that Mary Lincoln had an easy time giving up her husband to death in such a horrible way. I don’t know if “seances” continued at her request–but I wouldn’t be surprised after seeing these charts. Moon-Mars = Mc: self-promotion; getting things off the ground; a forceful and purposeful nature; ego-consciousness. Moon-Mars = US n Neptune: weaving a spell for personal gain; duplicity; emotional magic; a negative attitude or character; misdirection of energy; grief; renunciation; weakness of will. As you may know, whenever death is the issue, the astrology of the matter most often shows Moon/ASC and Jupiter links to planets, house cusps and especially to chart angles. Mars (energy) is always involved, of course, and the Sun (vitality) must be roped into the picture bwo harsh transits, progressions, and aspects. That evening’s Sun and Neptune were in Aries–the sign ruling the head–with the racist, oppressive Pluto-Chiron midpoint 14Ari42–conj Lincoln’s natal Pallas 14Ari41. Pallas’ keywords are: ‘wisdom’ and ‘strategy’…and Booth didn’t care for Lincoln’s in the least. The revolutionary combo of Mars and Uranus, the sneaky and possibly death-dealing pairing of Neptune and Pluto–indicate activists, instigators, assassins, spies and saboteurs–all having their parts to play: plus I’ve included Pluto and Chiron although they were unknown at the time. Here you see transiting Moon/ASC at Lincoln’s Midheaven, effectively ending his life’s aspirations and very breath. 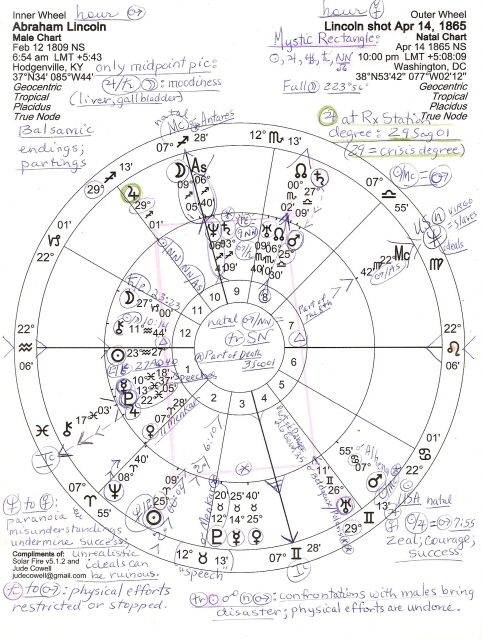 And the Mc of the shooting chart itself (22Vir42) is conjunct America’s natal Neptune to the degree–representing our nation’s ideals and other nebulous things (such as the Secret Service which Lincoln created), esp when blended with Pluto and his invisible helmet. Neptune veils and obscures which makes me believe that the reasons (Mc = WHY?) for Lincoln’s assassination have never been fully revealed. Jupiter is also “money”…a paid assassin? Knights of the Golden Circle, a Klan forerunner? Then of course there’s the theory that Lincoln was killed because he had made noises about reforming the world banking system (as did JFK.) This would certainly keep “assassination Jupiter” in the running as part of the plot. The first moment when Jupiter made his standstill 29Sag01 at 4:17 am (in order to turn Rx) was one hour 7 minutes before Lincoln passed away and at that minute this significator of the Republican Party was at tr Midheaven 28Sag00 over Washington DC. These factors are all to be compared with the natal (birth) chart, progressed charts, Solar Arc Directions, Return charts, etc, along with the transits for the time of death–and in this case, of the shooting of the president, an act which Booth hoped would take the south back into war. A popular actor, Booth was a racist of the most heinous kind, and as a southerner, I can say that he never spoke or acted for me. In fact, my father had a maiden aunt who remembered Lincoln and his murder, as the newspapers termed it. A $50,000 reward (later $100,000) was offered for the capture of John Wilkes Booth, while $25,000 each was offered for (some of ?) the other conspirators. Sun-Pluto = ASC: a crisis of self-preservation. Paralyzed from the neck down after being shot, Booth is said to have whispered to tell his mother that he “did it for his country.” Guess that’s the kind of illusion one must be under to go violently against one’s fellow man–or to willingly be under the sway of voices in the head, or to act for blood money from outer sources–or even for what one imagines is a hallowed ’cause’. Well, perhaps I’ll add more on Booth here but my main focus is on Abraham Lincoln whose Two-Hundredth Anniversary of birth is Feb 12, 2009. I will update this Page as time permits and inspires. Below is a link to one source in case you’d like to refresh yourself on those difficult days, and I would be open to taking questions on the matter which may be checked with the applicable charts. You may leave a comment/query on this blog or you’re welcome to contact me @: judecowell at gmail dot com, but no spam, please–I never read it and always delete it, so you’d be wasting your time and effort, m’friend. For more info, check out Wikipedia’s Lincoln Assassination page. wow karla, thanks a bunch! Before World War I, two opposing systems of political economy competed for dominance in the United States. One was the New York financial district, which came to symbolize American finance. Its most important address was 23 Wall Street, known as the “House of Morgan.” Mr. J. P. Morgan was an agent of private Jewish banking interests. Since private financiers controlled the gold, they established a national currency based on the “gold standard.” Today the gold standard has been eliminated, and the global economy is based on funny money. This allows an increase of debt as never before in world history. The other system dated back to Benjamin Franklin. It operated out of Philadelphia, which was the USA’s first capitol before the capitol was moved to Washington. At one of the Constitutional Conventions, Franklin’s “Society for Political Inquiries” planned an economy that would free us from economic slavery to England. In response, England sent troops to enforce the private Jewish bankers’ power, thus sparking the War Of Independence. The Philadelphia faction favored a bank on a model established in provincial Pennsylvania. In this model, a state office issued or lent money, collected the interest, and returned it to the provincial government to be used in place of taxes. President Lincoln returned to the colonial system of government-issued money during the Civil War, but the bankers assassinated him and reclaimed control of the money machine. As you know, the bankers’ power was finally sealed by the Federal Reserve Act of 1913, plus the Income Tax Act, World War I, and the Great Depression. Private banks deliberately caused all these disasters. Today the average person assumes that government (not private bankers) creates money. Therefore everyone thinks inflation is caused by an out-of-control government running the dollar printing presses. In reality, inflation is caused by private bankers issuing loans. As noted above, every dollar they create is a loan we must pay back to the bankers with interest. 1. Economics. a persistent, substantial rise in the general level of prices related to an increase in the volume of money and resulting in the loss of value of currency (opposed to DEFLATION). 2.	the act of inflating. 3.	the state of being inflated. About 97% of our currency is not coins or bills. It exists only in the computers of private central banks. The interest on the U.S. government’s $9 trillion debt will soon be more than the taxpayers can afford to pay. When taxpayers can’t pay it, the economy will collapse. Then private bankers will launch World War III. Economists are paid to chatter about nothing. Their lies conceal the power of the private bankers. Economics needs lightening up with imagery, metaphors, characters, and a plot.. Since Ben Bernanke touted the U.S. Dollar’s muscle in 2002, the greenback has fallen 40% against world currencies. Unraveling the future direction of the U.S. Dollar has consistently made fools of economists and other financial gurus. But right now, if you closely examine the history and current economic tradewinds, the clouds begin to part. Fact is, the value of the dollar isn’t just some nebulous economic macrotrend. It has a dramatic effect on your everyday life. From the cost of food and gasoline, to interest rates on car and home loans, Americans deal with the impact of the incredible shrinking dollar in their businesses and daily lives.